When we look at apps, the first comments are usually around if the app has a UI that is like what Apple would do. Is it easy to use? Does it allow the job to get done without a manual? And, is it pleasing to the eye? When it comes to text editors, you have your notes apps for taking and sharing notes from meetings and you have your Microsoft Word knock offs that do everything you can do on your desktop computer. Then, along came TextKraft. We first saw it from one of our writers in Germany, as a German language iPad app. Now, Textkraft is available in English too. 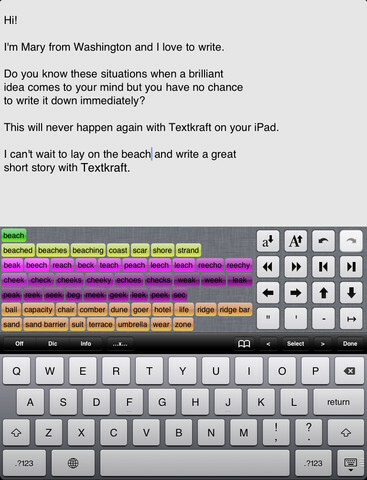 Textkraft is more for the serious writer as it’s layout is less Apple and more purpose built. You ‘could’ use it for taking meeting notes but it is really best suited for writers. 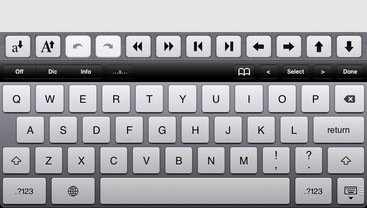 A quick access bar of often used shortcuts can be shown above the keyboard. While these are also available through other iPad writing apps, Textkraft has them always available rather than hidden under a menu. Where Textkraft steps out from the norm is the many other bits of information that can be accessed in the area above the built-in keyboard. Textkraft uses an embedded dictionary, the words above the keyboard (tap to insert) can be similar words, synonyms and potential follow-up text. The feature list is too long to rattle through here… if your serious about writing, you are probably covered with Textkraft. The many sharing and storage options offered by Textkraft means that your creation is always safe and easy to get out to others for review and comment. Text can be sent directly to a Pages layout you have on your iPad too which will really speed up editing a document text for a finished product.